If you looking for web tutorial on X-editable jquery plugin, then you have come on right place in this post we have make discussion on how to live update or edit of mysql table data by using X-editable jquery plugin as front-end and as back-end we have use PHP script. We will make simple inline table edit of data by using X-editable with PHP. We have received many request from our readers so we have make this type of tutorial. 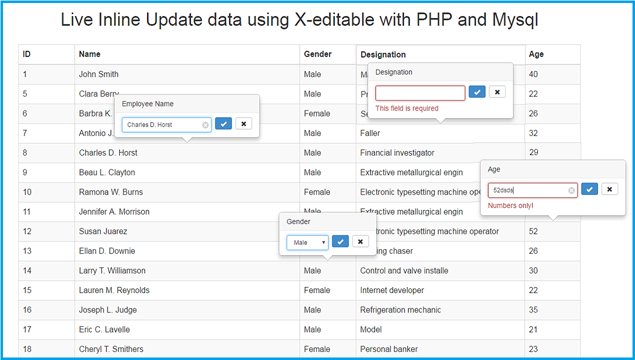 In this post we will inline edit of data with X-editable with PHP and Mysql. Live Inline updating of data is extremely required functionality of website that will authorize user can edit without going to other pages. In this you can edit single column data at one time. There are many inline editing plugin available but we have use X-editable plugin that make html element editable inline. First we have include following links in our index page. Thenafter we have define simple html table, we will load data under this table. We have make this jquery function which fetch data from table and display under above table. We have write this php code that received request from Ajax and fetch data from table and send back data to Ajax request. Now we want to make table column editable by using this editable method, here we have make editable table column like name, gender, designation and age table column. We have also put validation like required field for all column and we have also use number only validation for age table column also. We have also make select box in gender table column also. This all feature we have use by using this X-editable plugin. Here we have send ajax request for update of data to update.php page. This way it will update particular table column data by using X-editable plugin. Lastly, this PHP code will update particular table column data as per it received ajax request with data. It is not showing the data. Please help me!